Watch the fireworks over the lake from the famous Omi-Maiko beach. Near JR Omi-Maiko Station (Kosei Line) in western Otsu. If rained out, to be postponed to July 29. Climax of Imazu’s summer festival starting from 1 pm. Near JR Omi-Imazu Station. Fireworks is part of their summer festival that starts at 4 pm. Fireworks is the climax of this summer festival (bon dance, etc.) held in the northern parking lot of Hino Town Hall starting in mid-afternoon. Part of an illumination and music festival. 20-min. by bus from Yokaichi Station. Fireworks start at 8:40 pm. 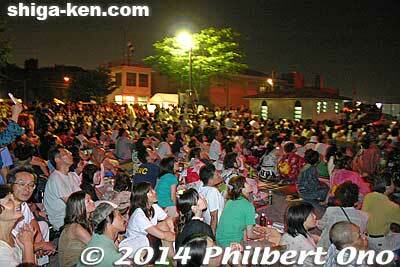 Fireworks is the climax of this summer festival (Goshu Ondo bon dance, stage entertainment, etc.) held at the Yasugawa River Shinzui Koen park (野洲川親水公園). Fireworks are part of the summer festival with taiko drummers and lantern floating on the river. Held annually on Aug. 16. Held near JR Kinomoto Station. Climax of a local festival with food stalls and games held during Aug. 22–25. Watch the fireworks over the lake from the famous Omi-Maiko beach. Near JR Omi-Maiko Station (Kosei Line) in western Otsu. If rained out, to be postponed to July 23. Here’s the 2016 summer fireworks (hanabi) schedule for Shiga Prefecture (Shiga-ken hanabi) listed by date. Keep in mind that foul weather is always possible and fireworks can be canceled. Near the Inugami River Muchinbashi Bridge. 10-min. walk from Ohmi Railways Takamiya Station. If rained out, to be postponed to July 10. At two locations along the Echigawa River bank near Miyukibashi Bridge. 15-min. walk from Ohmi Railways Echigawa Station. If rained out, to be postponed to July 23. About 40,000 people are expected. Along the Yasu River. 20-min. walk from JR Moriyama Station. A variety of activities (hot air balloon rides, flea market, and more) will held in the afternoon. If rained out, to be postponed to July ??. Watch the fireworks over the lake from the famous Omi-Maiko beach. Near JR Omi-Maiko Station (Kosei Line) in western Otsu. If rained out, to be postponed to July ??. 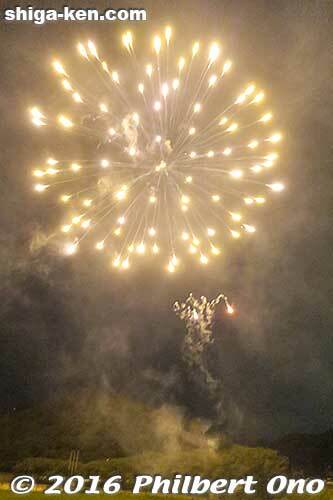 Koka’s biggest fireworks display held along Yasu River. Part of a local festival of stage entertainment, games, and food stalls. Near Ohmi Railways Minakuchi Jonan Station. 35-min. walk from Hikone Station. Shuttle buses provided from Hikone Station to a sports ground from which it’s a 15-min. walk to the beach. If rained out, to be postponed to Aug. 2. 20-min. 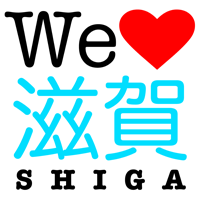 walk from Ogoto Onsen Station. Fireworks can be seen from most onsen (hot spring) ryokan and outdoor baths in Ogoto. If rained out, to be postponed to Aug. 2. Climax of Imazu’s summer festival starting from 1 pm. 10-min. walk from Nagahama Station. Very crowded so go early to save a spot or pay for special seating for 1,500 yen or 2,500 yen. If rained out, to be postponed to Aug. 5. Fireworks are part of the summer festival with taiko drummers and lantern floating on the river. Near Seta-no-Karahashi Bridge. Short walk from Karahashi-mae Station on the Keihan Line. Fireworks will climax the waterborne Takebe Taisha Senkosai festival on boats. 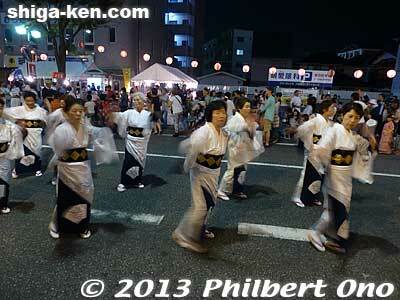 Climax of a local festival with food stalls and games held during Aug. 22-25.